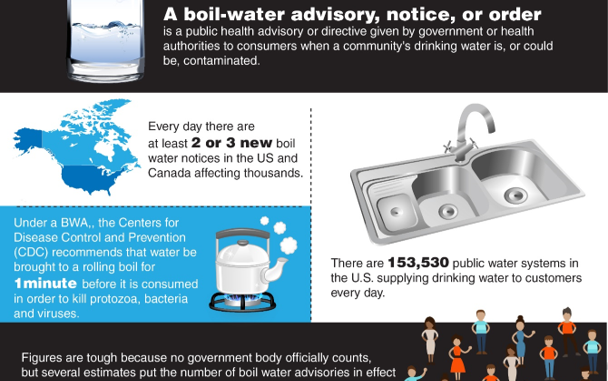 What is a Boil Water Advsiory? A Boil Water Advisory is a precautionary measure made to the public advising everyone in the affected area to boil tap water before using it. A public statement is released during this time in order to let people know that there is a problem that can potentially contaminate the water distribution system such as a water main break, loss of system pressure, bacteria, sewage leak, chemical/oil/gas spill, software issue or a natural disaster like a hurricane. It can take at least 16 hours before water test sample results are released. Boil Water Advisories are necessary at this time until results confirm that water is safe to use regularly again. When a Boil Water Advisory is issued, customers or residents affected are notified. In the event that the boil water advisory is widespread, public utilities will make use of available media such as radio, social media, emails, website, phone calls and television to inform the public. Everyone under a boil water advisory must boil their tap water for one minute to kill possible bacteria. Meanwhile, customer service (communication with the public) and field crews are doing their jobs behind the scenes by isolating the damaged water main breaks, repairing water lines and pipes, and flushing and disinfecting them to avoid contamination before the public can use tap water again. Boil Water Advisories will remain in effect for at least 18-24 hours. The advisory will remain in effect at that time until test samples show that water is safe to drink or use. What is the Difference between a Boil Water Advisory and Boil Water Notice? Boil Water Advisories are public statements issued advising customers to boil tap water before using it for bathing, drinking, making ice cubes, washing dishes and laundry. An advisory does not necessarily mean that the tap water is contaminated, it only means that the water ‘could be contaminated’; therefore precautionary measures must be taken. Boil Water Notices are different from an advisory; they are issued when contamination in the water system is confirmed. Will I Get Sick If I Drink the Water or If I Drank Some Water Before or During a Boil Water Advisory? If you happen to consume water before or during an advisory is in effect, don’t worry. As long as you are healthy, chances are you will not get sick. Pregnant women, newborns and infants, senior citizens and people with illnesses are vulnerable to diseases and must not drink from the tap water until it is deemed safe to drink. Only boiled water or bottled water must be given to them. Watch out for any of the following symptoms: diarrhea, cramps, headache, nausea and vomiting. If any of these symptoms are present, seek medical assistance right away. Will Customers Be Notified When A Boil Water Advisory Has Been Lifted? Yes. Customers will be advised that a boil water advisory has been lifted and that it is safe to use tap water again through social media, news media, the local water utility’s website, phone calls or emails. Customers affected need to flush or disinfect their pipes, water filters, and anything that comes into contact with their drinking water before using water again regularly.